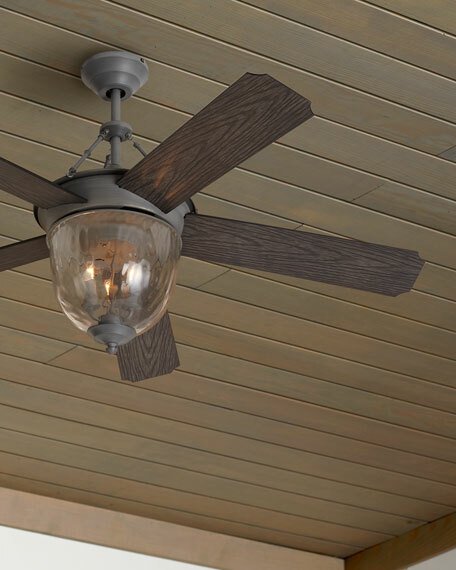 Aged Galvanized Knightsbridge Indoor/Out Ceiling Fan, 52"
Elegant and impeccable ceiling fan, With a subtle nod to medieval art and metalwork, intricately shaped fan blades and the soft glow of its central candelabrum enclosed in clear hammered glass, brings a warmth and sophistication to both the indoors and outdoors. Indoor/outdoor damp-rated ceiling fan with large hammered glass integral light kit. Dual remotes controls for wall and hand held device. Three-light cluster, three 40-watt candelabra bulbs included. Ball hanger metal bracket included for hanging.